System Status - what does it mean? 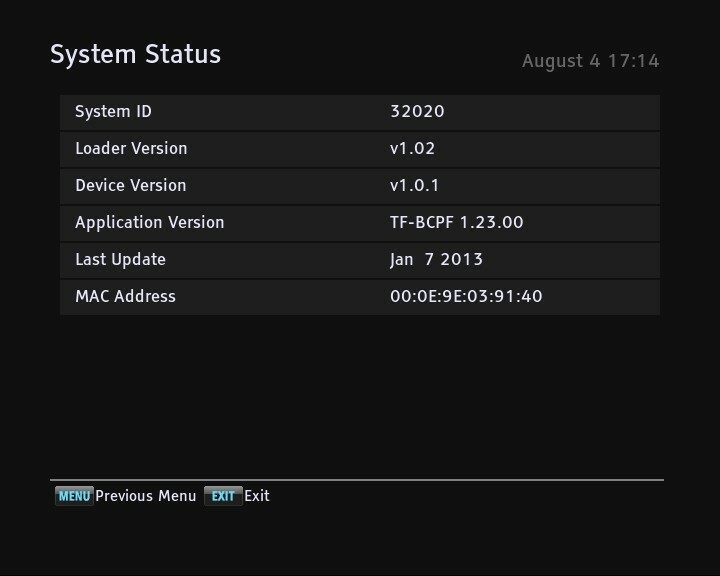 This is the firmware version that the Toppy is running. It is the Toppys operating system and is very compact Linux variant or, for the TRF-2000 and TF-T6000, it is an Android variant. This is the date on which the firmware was compiled. There is no explanation of what the Loader is; however I suspect it is the software than loads the Toppys firmware - similar to GNU GRUB bootloader used in many Linux distributions (see http://en.wikipedia.org/wiki/GNU_GRUB). If the bootloader for a firmware update differs from the one currently installed on the Toppy this does not matter. It will merely update the bootloader when it is installed. Sometimes new firmware uses an older Loader Version. It is safe to install firmware with an older Loader. This is the unique identifier of the on-board Ethernet port.